They’re slithery and scaly, and they have icky, flicking tongues and creepy, unblinking eyes. What’s to like about a snake? You’d be surprised! This little girl has a problem. Her family doesn’t have dogs, or cats, or birds—they have snakes! And she really, really, really really doesn’t like snakes. 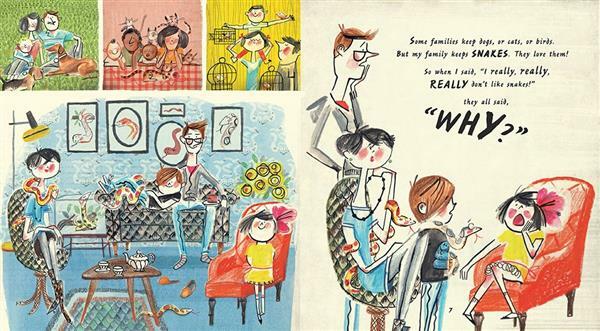 Her family can’t understand her dislike, but they canhelp her understand why snakes do the things they do and look the way they look. And maybe once she knows more, she will start to like snakes a little . . . or even a lot. 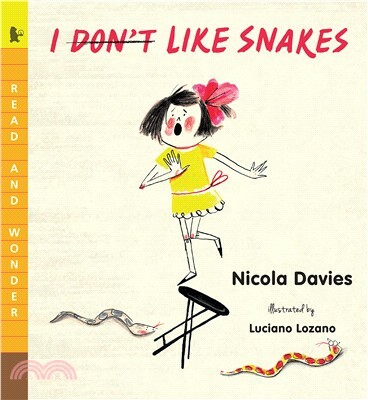 Packed with snake trivia, this clever story includes realistic illustrations and simple explanations of snake behavior sure to make even slither-phobic readers shed their misconceptions about these fascinating reptiles. Back matter includes a note about snakes, a bibliography, and an index. Nicola Davies trained as a zoologist and has written many award-winning books for children, including Extreme Animals and One Tiny Turtle. She wasn’t allowed to have a snake as a child, but she’s encountered snakes on her travels around the world. She lives in Devon, England.